To Luke Skywalker, it wasn't exactly home sweet home. As fans of "Star Wars" know well, young Skywalker longed to fly away from his home planet of Tatooine, where he worked with Uncle Owen and Aunt Beru Lars on the family moisture farm. A group of movie fans restored the Tunisian set that was used as Luke Skywalker's childhood home in "Star Wars." It wasn't exactly a beloved worldwide landmark, either. The striking domed home known as the Lars Homestead had been left to decay in the broiling temperatures of the Tunisian desert since filming of the original "Star Wars" ended in 1976. But a small group of "Star Wars" fans felt more kindly about the site -- so much so that they recently collected more than $11,000 through a Facebook page and spent four days working with locals in broiling temperatures to repair it. One member of the group, Mark Cox, and his wife Sarah actually held his wedding outside the Lars Homestead in 2010. Another, Mark Dermul, has written four books on "Star Wars" tourism. It was during a Tunisia trip led by Dermul that the idea of fixing the Lars Homestead came up. "While drinking a few Boga (Tunisian lemonade) in a local Cantina, (we) started joking about one day returning to restore the Lars Homestead to its full movie look-alike glory," the group wrote on its website. "What started as an off-the-cuff remark soon turned into a solid idea." The six-man group came to Tunisia from five countries and worked with Tunisian locals in temperatures topping 120 degrees. They chronicled the repairs on the website Save the Lars Homestead. When the group arrived on May 27, the domed home remembered by many from the film looked battered and crumbling, but by the time the group took photos on June 1, it was repaired, replastered, and painted a shining white. The team photographed their work putting in a new foundation, digging out the steps to the building, and restoring the steps with original pieces. 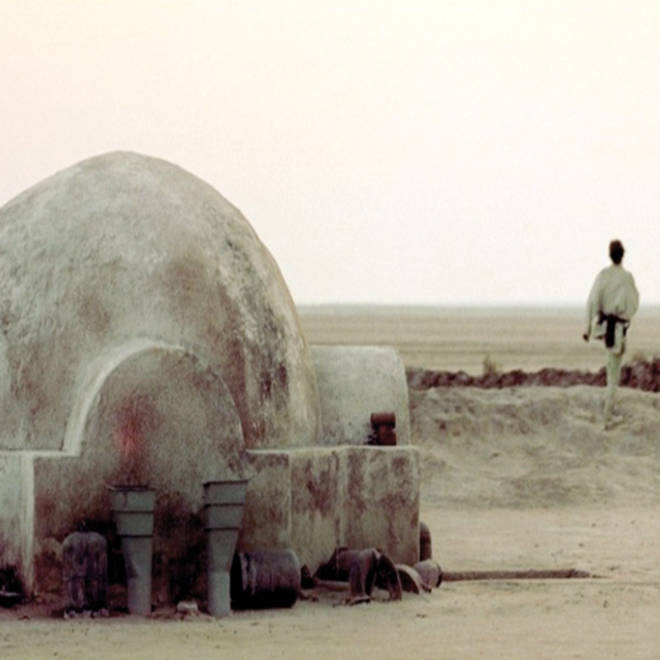 They even installed an entry coder with red and white buttons to mimic the one seen in "Star Wars," and deposited a mix of sand from all the different "Star Wars" Tunisian filming locations into the cement of the final step into the domed home. They also installed a commemorative plaque marking the site. "Luke's home is back!" the team wrote on their photo page. The website also features photos taken at such memorable movie settings as Jawa Rock, Artoo's Hideout, the city of Mos Espa, Ben Kenobi's Hermitage and the Mos Eisley Cantina, as well as settings from "Raiders of the Lost Ark," which also filmed in the area. The crew also visited the hotel which provided the courtyard and interior of the Lars Homestead. The group plans a video documentary and a book about their repair work. "Who in their right mind would travel out into the Tunisian desert to restore a plaster construction that was featured in some sci-fi flick?" the group wrote on their site. "Yep, that's us..."
What do you think of the fans' project? Tell us on Facebook. Feel the Force: Happy 35th anniversary, 'Star Wars'!